Two days before the launching of a new round of direct peace talks between Israel and the Palestinian Authority in Washington, USA, 4 Israelis were killed, on Tuesday 08/31/2010 at about 19:30, in a shooting attack in Hebron, the West Bank, believed to have been carried out by Hamas and aimed to derail the talks. The IDF was investigating two possibilities – that Palestinian terrorists had laid an ambush alongside the road or that the shots were fired from a passing car. Such attacks were expected since there is a long experience in the Middle East that level of violence always increases when peace talks between Israel and Palestinians heat up. Just recently Egyptian forces uncovered several caches of arms, ammunition, explosives, rockets and all kinds of missiles in Northern Sinai designated to be smuggled to Gaza Strip through Rafah Tunnels (see – Rafah 08.28.10). Hamas also sharply criticized and denounced the peace talks and described them as a betrayal of the Palestinian interests. Hamas can and it is assumed they will increase the military tension around Gaza Strip should the talks go forward successfully. The four victims, described by a settler spokesman as a couple and two hitchhikers –were driving on Route 60 near the Southern entrance to Kiryat Arba when their vehicle came under fire. 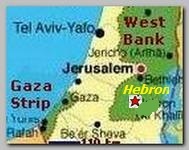 Hebron area is a very conservative Islamic region and was always a hotbed for radicals and militants. In 1929 the Arabs in Hebron committed a pogrom against their neighbor Jews. They killed 66 Jews and forced all the others, who lived in Hebron for about 3,000 years, to leave the town. Nowadays Hebron is the stronghold of Hamas in the West Bank. Prime Minister Binyamin Netanyahu, who heard about the attack on his way to Washington to re-launch direct talks with the Palestinians, said upon landing that he would speak in the evening with US Secretary of State Hilary Clinton and tell her that this “criminal attack” proves again the need for Israel to stand steadfastly by its security demands. In the Gaza Strip, Hamas was quick to hail the shooting. “Hamas blesses the Hebron operation and considers it as a normal reaction to the occupation crime and a proof of the failure…to abort the project of resistance, “Hamas spokesman Sami Abu Zuhri said in a statement.